A masterful thriller that makes meaning out of the meaningless. A taught thriller that keeps you hooked from the very first frame until the very last, Denis Villeneuve’s Sicario secures audience engagement with a solid and complete narrative. Performances and cinematography may entrance, but it is the story that locks us in with its rendition of all four major Throughlines. A complete narrative functions as a model of a single human mind problem-solving an iequity. The individual Throughlines offer the Audience an opportunity to see this inequity from all the possible different perspectives. The Main Character Throughline gives us the way in and a chance to feel the conflict personally. The Influence Character Throughline stands in our way and offers an alternative perspective towards resolving the inequity. The Relationship Story Throughline shows us what it is like when we go about resolving inequity. And finally the Overall Story Throughline grants us that objective view of the inequity and the efforts from every character to resolve it. Four major Throughlines, four different perspectives. Leave one out and you risk leaving a large gap in the logic of your story. 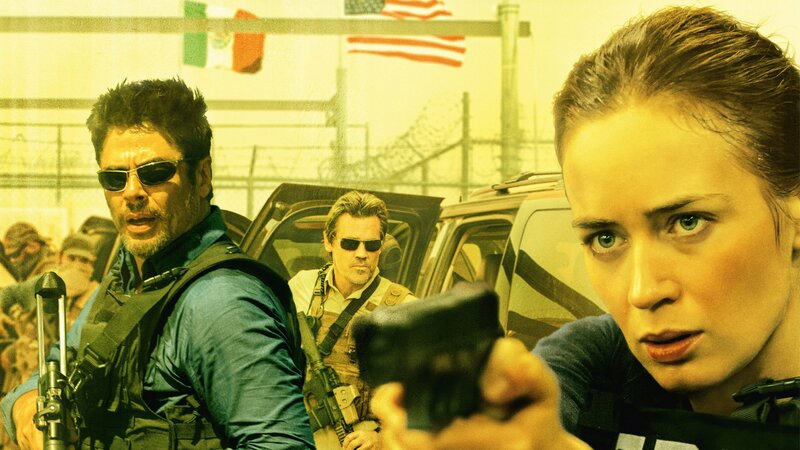 Cover them all—as Sicario does—and you only risk them demanding a second viewing. Main Character Kate (Emily Blunt) shows us what it is like to deal with these dangerous activities on a personal level. We are there with her during the first raid and right by her side during the expedition in the tunnel. While there are dangerous activities going on around her, it is only through her eyes that we get to feel what is like to experience conflict within the context of physical activities (Main Character Throughline Domain of Activity). We feel what it is like to fight this battle on the ground (Doing), we feel what it is like to kill the enemy (Obtaining), we feel what it is like to misunderstand the intentions of our coworkers (Understanding), and we feel the conflict involved in finding out exactly what is going on (Learning). This last one represents Kate’s greatest area of personal Concern (Main Character Concern of Learning): learning about Juarez, learning about those hidden tunnels across the border, learning how to deal with local authorities when crossing the border. This Concern of Learning keys us in on the kind of Issues we will be facing on a personal level from Kate’s point-of-view. Prerequisites—or essential steps—are witnessed by the regulations she feels driven to follow. Strategy covers her personal distaste for the plan-of-attack presented to her. Analysis is seen in her threats of reporting what she sees. And finally, the greatest Issue of all for Kate are those Preconditions (Main Character Issue of Preconditions). All of these variations of narrative create conflict for her; it is the last that is the true source of her troubles. Kate is being used as a Precondition for all of this illegal activity to occur. Without her, the CIA could not conduct its operation; they need local law enforcement along for the ride in order to operate within the U.S. border. Kate fulfills that precondition and is shown to be a major issue for her personally. Alejandro Gillick (Benicio del Toro) represents the alternative perspective that challenges Kate’s way of resolving problems. Experiencing him on a first-person intimate level, we the audience get to see the impact such an approach has through the context of manipulations (Influence Character Domain of Manipulation). Alejandro’s sole purpose is to intimidate and coerce everyone around him, not simply Kate. The water-boarding. The murders. Whereas the physical conflict Kate experiences truly are the source of trouble in her Throughline, the “message” Alejandro is trying to communicate to the Mexican drug cartels is more a call to change one’s way of thinking and to get the idea that the big boys are back in town (Influence Character Concern of Conceiving an Idea). When the Colombians fell out of power, they left behind a significant hole in the trafficking of illegal trugs. This deficit led to a violent power struggle that threatens the stability of everyone’s operations (U.S. included). Alejandro is there to fix that, and his focus on that deficiency of leadership drives Kate and many other to reconsider their position on the situation (Influence Character Issue of Deficiency). Permission works as a wonderful counterpoint to this Issue because really, who the heck is giving permission to a former Colombian hitman to work side-by-side with the C.I.A.? With the Main Character in Activity and the Influence Character in Manipulation, the Overall Story Throughline is left with two options: a problematic Situation or a problem with Fixed Attitudes. Remember that the Overall Story is a perspective taking a look at everyone in the story and the problems they face. Whether F.B.I. or C.I.A., Medellín or Mexican drug cartel, crossing the border or Juárez citizen, every last character is stuck in this bad situation—and it’s not changing anytime soon (Overall Story Throughline of Situation and *Overall Story Concern of The Present). The drug trade is not going anywhere, and in fact mention is made that until they can somehow convince 20% of the population to stop using, the war will continue. Efforts by Graver (Josh Brolin) and friends are simply an attempt to reestablish order in the here and now (Overall Story Goal of The Present). Some are drawn to the promise of easy money (Attraction — Phoenix’s finest). Others are repulsed by decapitated bodies hanging from suspended train tracks (Repulsion — Kate and Juárez locals). Still others do what they can to keep their children fed and a roof over their heads (Work — corrupt officer Silvio). Yet it is the Attempt to do something outside of regulations that receives the most attention here. Waiting to call “weapons free” until the R.O.E. can be obscured by place and time is a blatant example of engaging in a problematic Attempt (*Overall Story Issue of Attempt*). Diving beneath the Issue of Attempt it is clear to see that Graver and officials higher than him have taken into account the situation and the players involved and have come up with a plan (Overall Story Problem of Evaluation). Doing nothing is no longer an option (Overall Story Symptom of Inaction); America needs to be protected until such time when those involved reassess the current balance of power (Overall Story Response of Protection and Overall Story Solution of Re-evaluation). Many stories stop with those three.1 Lucky for us, Sicario completed the argument by giving us that final perspective of what it is like when we have a problem. Securing the Overall Story Issue in Attempt forces the Relationship Story Issue in Doubt. From the very beginning, Kate doubts Alejandro and his story, where he is from and what he is capable of doing. That doubt puts a wall between them and keeps them from working efficiently together. Their relationship—this gathering of the “good guys” and “the enemy of my enemy” is seen within the context of Fixed Attitudes (Relationship Story Throughline of Fixed Attitudes)—Kate sees it one way, Alejandro sees it another. Counter this issue of skepticism between them with a drive between both to investigate what the other is up to and you have the foundation for a meaningful relationship to counter-balance the more logisitical problems occurring in the Overall Story (Relationship Story Counterpoint of Investigation). The lack of contemplation on either side fuels the heart of the story and hints at the Author’s true reason for writing this piece (Relationship Story Concern of Contemplation). Beyond supplying the audience with all four Throughlines, Sicario is masterful in its ability to craft Multi-Appreciation Moments. These are events that—depending on what perspective you take—look like completely different story elements. What looks like a Main Character Response could just as easily be read as an Overall Story Catalyst, i.e. Kate’s refusal to play the game impedes the mission to bring order back to the border (Main Character Response of Non-Acceptance and Overall Story Inhibitor of Appraisal. The final sequence in Kate’s hotel room also speaks of multiple story points: Alejandro’s holding the gun to Kate’s head fulfills the Relationship Story Response story point of Production, while simultaneously reinforcing Alejandro’s mission of securing his position (Influence Character Response of Protection Changed and Main Character Solution of Re-evaluation), and finally cluing us in on her level of personal angst (Story Judgment of Bad). Sicario showcases the power narrative has of bringing meaning to the meaningless. Sure, Kate’s Changed Resolve might not have resulted in her relieving any angst she may have towards her actions, but that lack of relief says something about our current approach today: we may be successful, but we’ll never feel good about it. These events are on-going and will continue to persist without meaning, and without reason. It is only once the narrativist gets a hold of such subject matter and wraps it within the framework of a powerful and complete argument that purpose and greater understanding can arise.